Givi X.01 Tourer Helmet - Not Just Luggage Anymore! You have known Givi as the Italian maker of premium hard-case luggage, but did you know that they also produced helmets? Quite popular in Europe, but until now without a US equivalent, Givi actually has quite a reputation in this field. Enter the Givi X.01 Tourer Helmet! 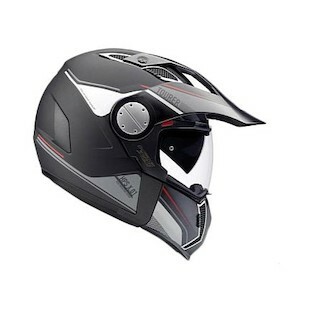 Inspired by the world of ADV/Touring, the X.01 helmet is a modular solution to many riding environments. First, while the peak may be useful for enduro riding, it is removable for those that spend more time on the street. In addition, the entire chin-bar section is also removable as we have seen in the likes of the Nolan N-43. A drop-down sunvisor completes the 'transformers' effect. Givi has definitely pioneered a unique look and design with their luggage. We hope to see their research and development in the helmet world make its way across the pond this summer.